Unity. Creativity. Artistry. These are just a few things that contribute to the creation of a community mural in downtown Vermillion. Several murals fill the alleyways of downtown Vermillion that share the stories of people all around the community. 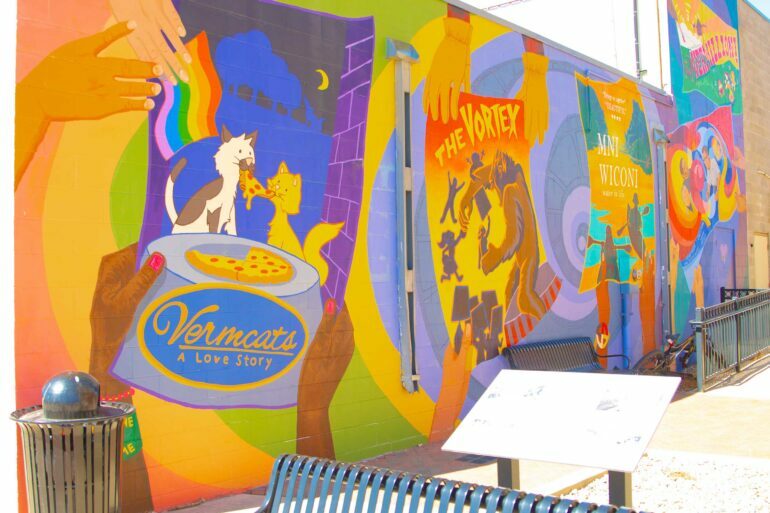 This summer, the Vermillion Cultural Association will be designing and creating a new mural on the north side of the Coyote Twin Theater. This mural will be designed and created by people in the community, led by three artists: USD students Inkpa Mani and Elizabeth Skye and USD graduate Reyna Hernandez. Senior fine arts major Inkpa Mani said this is his first mural project and he is excited to see the final product. Before painting begins, community members and artists plan what the mural will look like by holding meetings and workshops where people can collect ideas from different perspectives. For the next few weeks, the Vermillion Cultural Association will hold design workshops for citizens to tell stories, make drawings and continue planning out the new mural. Mani said right now the artists are simply taking in ideas from the community to see how they want to be represented. Once the design is completed and approved by the community, painting begins. Anybody in the community is welcome to come paint throughout the few days scheduled during the summer. Hansen said she expects the painting to be complete at the end of the July.